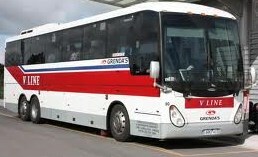 V/Line Coach Services operate and picks up and drops off passengers to and from Corinella at selected pick up points. there is Car parking here to leave your vehicle also a Shelter with Seat while you wait for your Coach. If you are heading South, the pick up point is just opposite on the South bound side of the highway. either the Northern or Southerly Destinations. V/Line Coach from some of those townships. There is shelter from the weather at the bus stop outside the Public Hall and at Guy/Argent Rd. Timetable Booklets are available to collect at the Corinella General Store and Corinella Community Centre. Do You Want To View A Current Timetable For Corinella? Departs from the terminus on Champs Elysees Esp and runs via Champs Elysees Esp, Cutty Sark Rd, Gellibrand St, Norsemens Rd, Agar Rd, Corinella Rd, Jamieson St, Cuthbert St, Balcombe St, Smythe St, Peters St, The Esplanade, Hamilton St and Smythe St to the Corinella Public Hall; then via Smythe St and Guy Rd to Tenby Point; then via Argent Rd, Corinella Rd and Bass Hwy to the terminus at the Vline stop on Bass Hwy near the corner of Pier Rd, Grantville. Departs from the terminus at the Vline stop on Bass Hwy near the corner of Pier Rd, Grantville, and runs via Bass Hwy, Corinella Rd and Argent Rd to Tenby Point; then via Guy Rd, Smythe St, Peters St, The Esplanade, Hamilton St and Smythe St to the Corinella Public Hall; then via Smythe St, Jamieson St, Corinella Rd, Agars Rd, Norsemens Rd, Gellibrand St, Cutty Sark Rd, Champs Elysees Esp, Kowloon Cr and Champs Elysees Esp to the terminus in Champs Elysees Esp at the corner of Cutty Sark Rd, Coronet Bay (opposite the general store). and outs of all of the town and district and probably even places we never new existed! The French Island Ferry Barge Operates Daily Between Corinella and French Island. or with your Car, Caravan, Bicycle or other Vehicle . A minimum 24 hours notice is required for bookings. 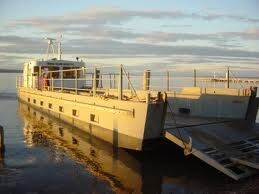 The barge accommodates two standard size cars or a large truck.